Finally, Across the Sound - the New Marketing Podcast just broke 500 listener subscribers. In fact, as of today, we're sitting on 517. That's a huge milestone I think in Podcasting. I think a certain Pete Lerma ClickZ article helped here...thanks Pete! To all who have read, listened, commented, dissented, subscribed etc....I am nothing without you. Just a voice without a home. Here's to the Juice, the Sound, the Truth, the Dialogue and most of all...to you! In the discussion over which is more important, the brand or the product, I think they're missing the idea that the product IS the brand and vice versa. What could possibly sell a product better than the product itself? Marketing ain't just what goes on in the media, it's part of the user experience. Chocolate isn't just fun to eat, according to a new branding statement by Mars. The company is selling its new Cocoavia chocolate bar as being "heart healthy." They even have the ultimate celebrity endorsement: science. Publicis Group, one of the ad agency major holding companies, recently founded a small consulting service called Denuo, which means "afresh" or "anew" in Latin. The goal of the agency is to help companies navigate the sometimes murky and choppy waters of the internet and all the things that have popped up there like blogs, search marketing and other such things. Rubel hates the idea. Jarvis loves it. Why the difference of opinion between the two? 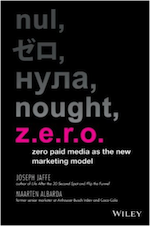 Steve thinks that the whole idea smacks of old-world thinking of "marketing to consumers, instead of with them." Jeff, on the other hand, thinks that anything that strives to make advertisers and the media companies that are dependent on them question established practices is a good thing. I have to say I agree with Jarvis on this one. Marketing IS about marketing people talking to customers instead of with them. Companies talk to people. People talk with people. That two-way communication needs to happen on a personal level. Reality is there's no way a major company can engage in an interactive communication process with its entire consumer base. You find a few key influencers and engage them in a dialogue. The key to me is more in the knowing what is being said about you as a company. That will give you power and allow you to focus your efforts more efficiently. A company should be aware that a piece of CGM has been created. It should be aware of when someone puts up a gripe on their blog, whether it's based on fact or a misconception. It's then up to them to respond in an appropriate manner to either one of those things. I don't think Publicis is actually out to "exploit" citizen media or any of these new-fangled communications tools the public has access to. I do think they're trying to find a way to make advertising folks and media members aware of what's going on out there and advise them on the best practices for existing in such a world. In part 2 of his 4 part expanded commentary on reinventing marketing, Bob Liodice hones in on integrated marketing communications. 1) What is the right marketing mix to support brand building efforts? 2) How much should be invested and over what time? 3) How do you tie the marketing messages together across media? 4) What are the core measurements? 5) What is the effectiveness of each medium individually and overall? It sounds simple on paper, but in reality this is unbelievably challenging for so many reasons – not the least of which are overarching barriers to integration which are deep-set and firmly ingrained in the cultural and organizational DNA of pretty much most organizations. Organic inertia, resistance (and fear) of change, not to mention bitter political opposition present a formidable challenge to anyone intent on embracing a new way of working. Furthermore, working together and “playing nicely” are virtually impossible when there is no process in place to facilitate “agnostic” collaboration. In chapter 10 of my book, I write about re:thinking the agency, and part of this discussion focuses on integration. You can download the chapter for free by clicking on this link. On Wednesday, the Associated Press ran a story about how AOL will actually be raising the price for its slower dialup service to meet that of its new broadband pricing that you might have seen on the company's latest ad campaign. The spots, which show "everyday people" going as fast as athletes competing in sporting events, are done that way to represent the level of speed that now these average folks who are AOL dialup users can now get. Broadband penetration is at a huge high in this country, so much so that Web developers and content creators have pretty much forgotten about people who are dialing in at 56k and below (56k, too, is a marketing thing - you can't go that fast on the phone). If an AOL were able to swing a ton of newbieish broadband users on the 'net, do we expect to see a change in what the consumer content generated will be, or do we think that now all of our parents will get to see Lazy Sunday at the same time that we do? A while ago during one of the IM conversation Tom Biro and I were having he had what I consider a genius idea. See Tom and I have a situation. Both of us write for AdJab but we also have other blogs and online efforts. Tom writes TheMediaDrop himself as well as Open the Dialogue for his employer, MWW. I run Movie Marketing Madness as a personal blog and also Bacon's Blog for Bacon's Information whom I work for. I also write a column titled Movie Marketing Madness for FilmThreat.com. So both of us are multi-bloggers. The problem we have is one of branding. How do we alert people to the full range of efforts we're involved in and not neglect one or more of the others? Tom's idea was simple: We encourage people to search for us. When you run "Tom Biro" through Google you'll see TMB, AJ and OTD all come up within the top five results. Do the same for "Chris Thilk" and you get my stuff. Tom's point is that quite separate from whatever we might be doing, we are the brand names. TMD, MMM, these are all just outlets for, essentially, us. This isn't at all to say that we're looking for new jobs - at all - or we actually need to be writing elsewhere. But let's just say that we're both comfortable with, and like being, interviewed on a number of topics, and don't feel like reading all the ProfNet requests out there on the wire? (No, we're not that obnoxious to think we know everything, stop it!) Do we, as probably-somewhere-on-the-C-list bloggers have enough cache that people might think "wow, I thought I remembered Chris Thilk writing about that a few weeks ago..." and yet they might not know where to find out about it? By writing in multiple locations as Tom and I do, it kind of divvies up your abilities to possibly different audience - which is fine - but it's not necessarily a good thing as fragmented as the Internet can be. Herein lies the concept - do we place advertisements, perhaps in a tongue-in-cheek kind of way, online, perhaps even through a podcast like Joe Jaffe's Across the Sound? It wouldn't be about branding our jobs, or AdJab, or anything else necessarily, just a kind of fun way to say "looking for xyz? Google Chris and/or Tom, and yada yada yada." At the very least, it seemed like a fun experiment, but it's unclear where it would lead. Needless to say, the opportunity to write here at JJ might be a good jumping point for things like this, and it allows us to pose the question - should bloggers - let's just say mostly the fully freelance ones - "brand" themselves out there? We all know that the sites they run and the words they write create the brand that they are, whether they like it or not (ask most bloggers who've been asked to do a paid gig or guest host how they got there, and the answer would actually be that their brand got them, even if they don't say it). So would marketing yourself by way of a search engine just in a way to, effectively, make yourself famous, work at all? Or is it just a parlor trick? NBC finds own foot. Shoots it. So NBC has decided that word of mouth is a bad thing. They've informed YouTube that the site is no longer allowed to make the "Lazy Sunday" skit/music video from Saturday Night Live available for viewing. That notification comes from the network's legal department. When the skit debuted in December it was put on YouTube and spread quickly via IM and email and made a lot of people consider watching the show again after giving up on it. What in the name of all that is goodness is NBC doing? Lorne Michaels should have kissed the ground YouTube's behind-the-scenes people walked on for the good they did by making the video available on their site. Lorne, it is never a bad thing when people are talking about your product in a positive way. Never. Do anything you can to facilitate that. Just because the skit is available for $1.99 on iTunes does not mean you need to shut down this grassroots viral effort. NBC just earned the Wanker Move of the Day award from me. "Hipster Babies" and "Yoga Mommies"
The prevalance of characters from kids shows who have merchandise with their images on it is leading to an increase in sales of those products. Not only that but there's an ever-growing demand for high-end kid's clothing and other accessories by a group that's been labeled "Yoga Mommies." This group is looking for products that are as much status symbols as they are toys or more practical items. That group is looking for things for their "Hipster Babies", whose outfits and such are designed and intended to reflect thei up-scale tendencies of their parents. This is more about marketing a lifestyle than marketing a product. The people behind these products have realized that there are a lot of people who think the right clothes will give their kids the perfect life. It's every bit as aspirational as those car ads featuring the SUV rolling up a hilltop and navigating muddy paths when the roughest terrain they'll likely face is the speed-bump in the McDonald's drive-thru. Based on the success of previous efforts with email marketing campaigns, Land Rover has decided to expand and contine the program. According to a Land Rover exec, the earlier campaigns generated positive results so they're sticking with it. The campaign comprises a series of e-mails targeting both prospective and existing customers. Give up? It's "propective." See I'm a prospective Land Rover buyer. But, based on my current needs and current income I'm not a likely Land Rover buyer. So I might be in the group that gets targeted because my name shows up on a list but that doesn't translate to any definitive buying plans. The best way, I think, to influence future customers is to give current customers a good experience. In the age where word-of-mouth or word-of-mouse is king a positive peer review will outweigh whatever canned marketing message a company might be sending via email. Give your current consumer base access to information on products they like and give them an easy way to share that information. The sales will come. The Onion has scored a massive scoop: an in-depth and inside the sausage factory interview with Gilllllette (5 x l's for 5 x blades) CEO, James M. Kilts. He's got some fighting words (not for sensitive eyes/ears) about being in it to win it and once you're done with this piece, you'll truly understand the utter brilliance of the Fusion strategy, positioning and breathtaking Super Bowl Spot.